As of today, Hubby and I have been married 10,975 days. In case you're counting, that's 30 years. Time passes so quickly that we hardly notice it. Yet, looking through our wedding album, I know how much has happened and how much has changed. Of our parents, grandparents, aunts and uncles who where there that day, only a few are still living. My sister, who was just 15 when she served as my maid of honor, is now the mother of two teenagers. Many of our friends have become grandparents. 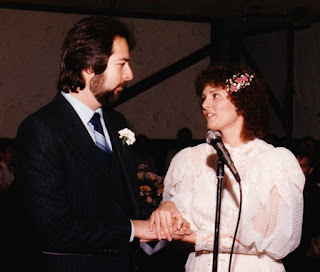 When I look at our wedding pictures, I'm struck by how young and fresh we looked. While I know that I look my age today, in my heart I don't feel a day older than I did then. And when I take a close look at my husband, I can still see the handsome young man I fell in love with so long ago. Whatever we may have imagined our future would bring, we never could have predicted all the things that really happened. I don't recall whether the words "for better or worse" were actually spoken during our ceremony, but we have had them both. It's been an amazing journey so far. Thirty years later, we are still making big plans and imagining a future that will undoubtedly hold many more surprises. "Make your marriage and the person you married your top priorities." It seems a bit too exclusive... but what about the children...? Owen, thanks for stopping by and taking the time to comment. Fortunately, our top priorities are not our only priorities, nor are they all that matters to us. I'm definitely not suggesting that the children be neglected. Children should be loved, nurtured, protected, and given lots of attention. They have a special place in our hearts that is like no other. Nevertheless, we know that for the majority of couples, marital happiness declines significantly after the arrival of the first child, and often it never recovers. I won't go into all the details in this comment, but experts agree that the child-centric marriage usually isn't good for either children or their parents. When parents prioritize their marriage, both they and their children benefit in the long run. Here's a link to a great article by Lori Lowe on having a happy marriage and happy kids. Happy Anniversary, Rosemary! 30 years is a big, big deal. Thank you for sharing posts that will help others make it that far and beyond! Cheers to many fine years ahead! Congratulations, Rosemary! You're now 'in my league'! The 2 of us have much to share other couples. Again, congratulations! Lori, thanks for stopping by!